The benefits of poetry for children are incredible and many. As we discussed in Part #1 of the series, poetry plays a huge role in your child’s development. Have you ever wondered how you could help your child in their language development, memory skills, vocabulary, or relationships? Well, keep on reading, because we are going to touch on each one of those topics. Discussing the importance of poetry and how it applies to your children was great, but I am super excited to share with you some of the amazing benefits of poetry for children. Because poetry is so enjoyable, I really don’t even think about the benefits of poetry for children. It’s not that I don’t care about them, but I am not consciously reading poems because I’m want my kids to be smarter. If the only reason you read poetry is because it is fun, then that is awesome. Good for you! However, if you’re interested in knowing some additional reasons why poetry is so amazing, then read on. If you are seeking to encourage your child’s language development, look no further. Of all the benefits of poetry for children, this may be the most basic. 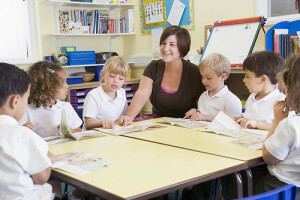 Poetry is a wonderful tool to use in promoting a child’s language development. With rhymes, children can easily learn new words. Furthermore, having children read poems aloud helps them practice pitch, voice inflection, and volume. While all of these may seem relatively simple, they are definitely necessary skills for language development. It really is quite a seamless flow that occurs naturally as we read poetry aloud. Besides encouraging a child’s language development, poetry is great for a child’s cognitive development as well. When we read poems to our children, they begin to understand that words may sound similar but have different meanings. Depending on the poem you are reading, children may be exposed to word families and begin to understand more about phonetic patterns. Due to the repetitive nature of poems – whether in word or meter – poetry definitely encourages children to recognize patterns. Furthermore, poetry is an excellent way to strengthen a child’s memory. These skills will be extremely helpful for future learning in math, new languages, and much more. 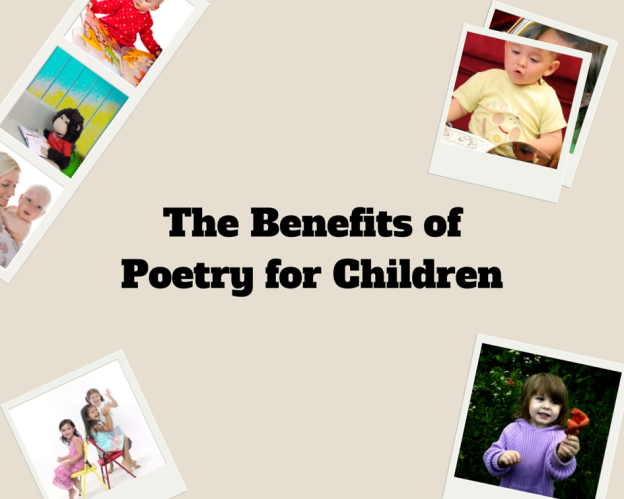 As you are beginning to see, the benefits of poetry for children are extensive and those I’ve included are only some of the wonderful ways poetry benefits your child. Although we briefly mentioned vocabulary when we discussed language development. This third benefit of poetry deserves to be examined more in depth. A good understanding of language and a comprehensive vocabulary is a quality much respected in individuals. Whether in school or later on in their careers, your children will need to have a good vocabulary to be successful in life. While reading in general is a great way to build vocabulary, I can guarantee that with poetry you can practically double or maybe even triple your child’s exposure to new words. The very nature of poetry demands for precise vocabulary to match the rhythm and rhyme of the poem. I can testify to this by my own experience. As I wrote many poems for the learning videos I create, I found myself discovering all sorts of new words. For a poem to be just right, it must have the perfect words, and as a poet, it is your responsibility to find them. In MonkiSee “ABC RoundUp” I wrote a poem for each letter of the alphabet. As you can imagine, I learned quite a few new words when I was writing those poems. Since building a child’s vocabulary seems to be a high priority for parents, I believe this may be the best of all the benefits of poetry for children. In addition to vocabulary expansion and language and cognitive development, relational development is another amazing benefit of reading poetry to children. By reading poetry to your child, you are strengthening your relationship together and bonding in such a unique and special way. It is so precious to be able to share a common interest and passion for poetry. How special it is to be have fun with your kids by reading silly poems together, discussing what poems are about, and even writing your own poems. However, this is not the only form of relational development. Besides strengthening your relationship with your child, reading poetry to children allows them to grow in their relationships with others. By reading poems, children are given various perspectives of the world we live in. They can see different points of view and understand variations in cultures and beliefs. They may learn right from wrong, develop an appreciation for good literature, and even grow in empathy for others. It’s amazing how simple poems can help us relate to others, and how we may establish friendships through poetry. My children have loved learning poems for school and reciting them for me and others. It gives them a sense of accomplishment when they have mastered a lengthy poem. We love reading and laughing at the silly poems of Jack Prelutsky and that Silly Old Bear. 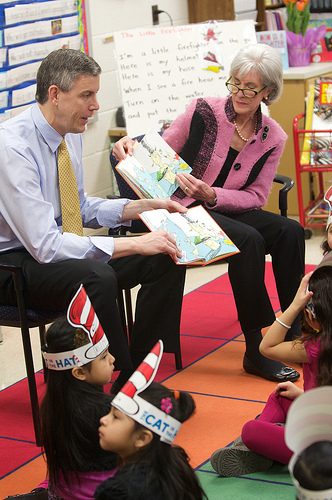 I hope that you are encouraged to begin reading poems with you children. I promise you, you will not regret it. If poetry has always been a bit daunting to you, start small. Read short silly poems together and grow from there. Nowadays there’s a decent selection of rhyming kids’ books you can read together. As your love and understanding of poetry progresses, you might surprise yourself and start writing your own little poems. If you fill yourself with poetry, don’t be surprised when it starts coming out of you too! And although there are many more benefits I could speak of, such as improvement in spelling, responsibility, public speaking, and so forth, I will conclude with this thought. I would love to hear your thoughts about poetry. Are you a poetry-lover? Did you know that poetry could be so beneficial? Do you need some book recommendations or ideas for incorporating poetry into your every day life? Check back next week for Part 3 of the series. We’ll be discussing the best poetry books for kids and how to include poetry in your child’s daily life. It’s going to be amazing, so don’t miss it. This entry was posted in Poetry and tagged benefits of poetry for children on April 8, 2015 by monkiseeblog.